Hey friends! It feels like it’s been ages since I wrote anything here … but maybe that is just because I’ve been knee deep in REFRESH planning and doing. I can’t even begin to put into words what it was like to see a dream God placed deep in my heart come to fruition — 90 women sitting around tables with Bibles open, spending a day studying Colossians. It was so beautiful. I’m sure I’ll write more about it when I reach the point I can even think about it without crying. We’re already working on 2020’s event so if you are anywhere near Florence, Alabama, you want to mark March 21, 2020 on your calendar and join us! So all that planning and preparing forced me to put into practice all those lopsided living principles I have written about so much over the years. My calendar has been ridiculously full lately — but I never want to sacrifice my desire to live a full life. I’ll be 48 this year and one of the priorities I have for my life is to love well and live full. Maybe that resonates with you also. But maybe you’re like me and not always sure how to make that happen. 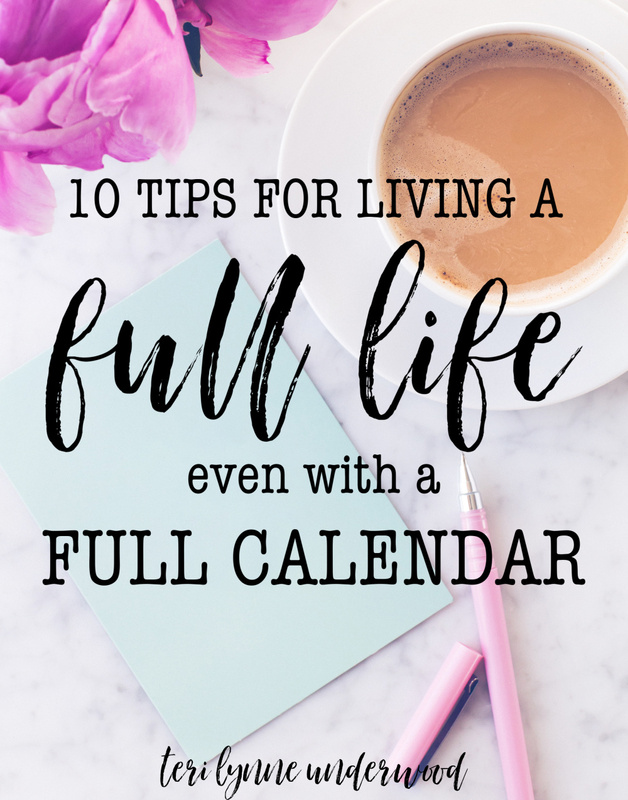 Today, I want to share with you a few simple ways I’ve discovered to live a full life even during the seasons when my calendar is full and overflowing. I know, I know, it’s hard. Trust me … I have often struggled to do this. But I’ve discovered that spending even just a few minutes in prayer and reading my Bible can really change the way I navigate the demands during the busy seasons. Check out these posts for more details about the value and purpose of a daily quiet time. During the busy seasons of life, it’s important for us to know our “why.” When you identify the why, it’s easier to say no to what doesn’t fit; but it also makes it much less frustrating when our calendar is crazy because we know we’ve assigned our priorities in line with God’s plan for us and our family. Acknowledge you can’t do it all. What If … We Give Ourselves Grace. It’s easy for me to miss this one. As an enneagram 3 I am all about the accomplishment, marking the things off my list. But, really as a Christ-follower, my number one calling and priority is always loving people. In the chaotic weeks, it can be easy to give our attention to what needs to be done. But especially during these times it’s important for us to pay careful attention to seeing and connecting with people. I know, when we’re super busy, rest is hard to do. But, the truth is, when we’re super busy rest is even more important. One of the things I have been doing the past couple of months is going to bed earlier. Even just fifteen minutes earlier can make a huge difference. I also take a nap every Sunday afternoon. In our house, everyone rests on Sunday afternoons. It’s a priority for us. Set aside time to rest. While rest has long been a practice for me, I’ve not always been as diligent in other areas of taking care of my body. But I have discovered that making sure I’m eating well, drinking enough water, and exercising have a HUGE impact on how I navigate the busy seasons. I have more energy and am less dependent on Mountain Dew when I’ve been consistently eating better, getting enough water, and making time to exercise. Okay, here’s where I really have to admit I’m a failure. I HATE asking for help. But, the truth is, I can’t do it all. And neither can you. We weren’t made to. So whether you ask someone else to load the dishwasher or fold a load of laundry or something bigger, asking for help can be a huge factor in how we feel AFTER our busy season ends. 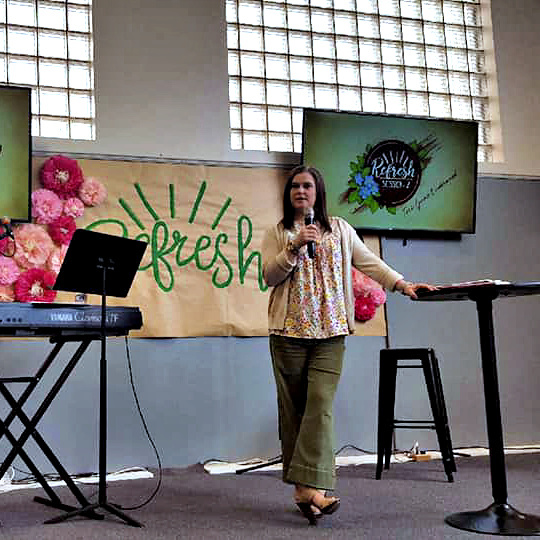 I am so thankful for the women on my ministry team who were willing to jump in and help in countless ways so we could make our conference a success. But I am also thankful for my family who pitched in at home so I had time to study and prepare for my messages during the conference. Asking for help isn’t easy … but we need to do it anyway. Do something you love, even when you’re too busy for it. One of the practices I’m finding most helpful in my quest to live fully no matter how full my calendar is simply doing things I love. Give yourself permission to take a break from all the things on the list and do something you enjoy, something that renews you. For me, that’s often baking. A couple of weeks ago, when things felt very overwhelming and I wasn’t sure I was going to be able to do it all, I just set a timer for an hour and made cookies. I didn’t have time … but I made time. And doing something that I just love was restorative in a way that helped me do the other things on my list without that sense of overwhelm. Set a stop time every day. This is another relatively new practice for me. But I stop working at supper time. We don’t always eat at the same time every night but no matter what I don’t work after supper. Establishing that stop time helps me mentally shift out of work mode into rest mode which helps me sleep better which ultimately makes me more productive during my work time. And also, our families need to see us set aside the to do list and be present. Encourage someone else every day. I think, of all the things on this list, this last one and the very first one are the ones that have the most impact. When I am intentional about encouraging other people every day, it helps me keep my focus off myself. I’m looking for ways to invest in others, to come alongside them, to see how God is using them. Offering encouragement to others is a gift we both give and receive. There is an inexplicable joy in taking the time to speak life into someone else. Okay, so that’s my list. What would you add? Any suggestions for living in that fullness of life Christ promises even when our calendars are super full? I’d love to hear what’s working for you!